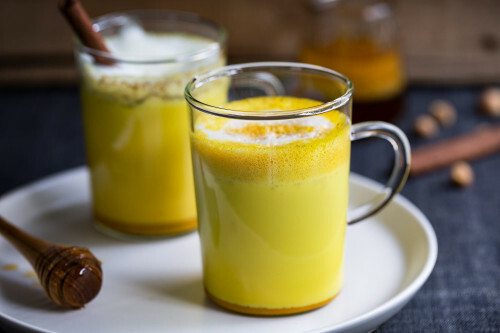 Home » Health » Turmeric Lattes: Is “Golden Milk” Healing Hype or Helper? The last time you were in a cafe or health-conscious eatery, you may have seen a “golden latte” on the menu. I know I’ve been seeing them everywhere around town recently. But is this item, made with turmeric, the oft-touted healthy spice, just the latest health trend or is it actually something of substance? Turmeric has a long history of medicinal use. Deployed in traditional Indian Ayurvedic medicine for centuries, the spice has antioxidants and anti-inflammatory effects and has been used to support liver health, blood health, joint function, memory, immune strength, and the digestive system. The active compound in turmeric is curcumin, which is believed to supply many of these potential health benefits. The spice has been consumed as part of a tea for centuries in rural India, and it is now sweeping its way into coffeehouses and shops specializing in health foods. But will adding one of these drinks to your daily routine aid your health? It’s hard to say. There is conflicting evidence about the efficacy of turmeric, so it might not provide all the benefits people say it does. There are studies that support its use, and it’s highly unlikely you’d ever consume enough of it for it to become harmful (up to 8 g can be consumed safely). So having a golden latte every day won’t do any harm, and it may help you stay healthy and help with memory in particular. However, I wouldn’t recommend it exclusively to treat illness. Curcumin only makes up about two to six percent of turmeric, and it’s not highly bioavailable (absorbed) when consumed as part of the spice. Therefore, your best bet for attaining its health benefits may be curcumin extract…but hey, where’s the fun in that? If you want to add a golden latte to your day, here’s a recipe for you to try. And please note the pepper—it’s extremely important because it increases the bioavailability of curcumin, so be sure to add it! Combine all your ingredients except for the milk and add a few tablespoons of hot water. The hot water will turn your ingredients into a paste, which you then pour through a strainer into your cup. Steam your milk until it’s frothy, if you like, and pour it over the mixture. Voila! You’ve got a golden latte in minutes! Fowlie, K., “Why The Turmeric Latte Trend Is Legit,” She Does the City, August 1, 2017; http://www.shedoesthecity.com/turmeric-latte-trend-legit, last accessed August 11, 2017. Patel, J., “Curcumin,” Examine; https://examine.com/supplements/curcumin/, last accessed August 11, 2017.